Tennessee Titans linebacker Jayon Brown knows a little something about the pain of the draft after watching four complete rounds and 154 other players celebrate before his name was finally called. By the end of next weekend, six new picks – give or take a few due to potential trades – will become the newest Tennessee Titans draft class. Top to bottom, those players will become linked together as part of the present and the future of the Titans. Titans general manager Jon Robinson talks about drafting well and stacking draft classes on top of each other to build a complete roster. It means getting contributions from up and down the draft class beyond special teams or being a backup waiting two years for an opening. Jayon Brown is the product of that process. He was the 155th overall selection, taken by the Titans with their fifth-round pick, and wound up making a sizable contribution to a playoff team last year. 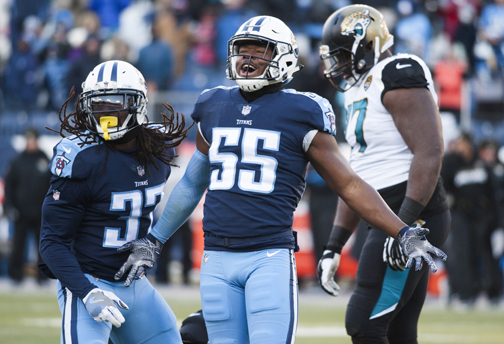 Brown, an undersized linebacker from UCLA, was the Titans’ nickel linebacker his rookie season, usually spelling Avery Williamson in the lineup in passing situations. He finished with 52 tackles and 1.5 sacks in his first NFL season. Brown, who garnered very little fanfare and attention in the draft process despite leading the Bruins in tackles as a senior and being an All-Pac 12 selection, knows what the 2018 hopefuls will be going through in the coming days. “I didn’t have any team visits,” Brown recalls, other than a courtesy meeting with the Los Angeles Rams that didn’t count against the Rams’ allotment of 30 visits since he was a local player. Although he attended the NFL Combine, only two teams bothered to give him a private workout outside of his pro day efforts. So Brown – like a lot of prospects not in the top tier of the draft – really didn’t know what to expect or where he might be drafted. Brown watched the entire draft faithfully, hoping to see his name on the screen. That meant two-plus days of watching and waiting. Fifth-round picks are often afterthoughts in a high-profile draft class. But Brown is living proof that late-rounders can’t be just written off as special teamers or project players. “I think I would tell anybody coming in, especially the mid-to-late-round guys, just come in with the mindset that you’re going to have to earn everything,” Brown said. “You’ve got to come in with your mindset that you’ve got to work and get the playbook down fast. So, for those watching the NFL Draft and wondering exactly who these newest Titans are and where they might fit into the team’s plans, Jayon Brown is a reminder that a successful draft won’t necessarily be measured in terms of a home run the first round, but the value and contributions made throughout the entire class. The draft begins at 7 p.m. Thursday with the first round. The next two rounds are Friday, 7 p.m.. The fourth round begins at noon Saturday. All rounds will air on Fox, ABC, ESPN, ESPN2, ESPN Deportes and NFL Network.